It's been said, many times, that even as an old man Guy Blanchet could outwalk, outpack, and outpaddle men half his age. Born in Ottawa in 1884 Blanchet graduated from McGill University in 1905 with a B.Sc. in Mining Engineering. After two years work in the Crowsnest Pass (Alberta/British Columbia) he qualified as a Dominion Land Surveyor and in 1910 joined the Federal Government’s Topographical Survey of Canada. It was here that he began to gain the reputation as a “tough, tireless worker and traveler”. In 1921 the Survey sent Blanchet north to begin mapping more than 300,000 square kilometres of largely unmapped territory centered on the East Arm of Great Slave Lake (map). The area Blanchet was asked to survey was a complicated maze of lakes and rivers for which only very rudimentary maps had been produced. Blanchet always consulted and employed knowledgeable Dene in his surveys and often traveled as they did, relying on what the land provided. During the late 1920s Blanchet was the Federal Government’s representative on northern mineral explorations conducted by Dominion Explorers Ltd. and also led the search when the owner of this company, Col. C.D.H. MacAlpine, became lost in the Arctic. In 1930 Blanchet retired from the Government to become a consultant. He took on projects in the Northwest Territories, Labrador, New Zealand and Fiji. In 1939, with the outbreak of war in Europe, Blanchet tried to volunteer for active military service by lying about his age – he claimed to be 45 when was actually 55. He made it as far as England before the ruse was discovered. 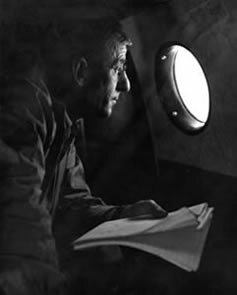 Even though he was denied active military service Blanchet was still able to make a significant contribution to the war effort. He was asked to survey, for the American military’s CANOL pipeline project, a route west from Norman Wells, across the Mackenzie Mountains into the Yukon, and on to Whitehorse. Much of this route followed an ancient Mountain Dene trail and the pipeline that was eventually built along the surveyed route supplied oil, for a brief time near the end of the Second World War, to a Whitehorse refinery. Guy Blanchet spent much of his retirement in Victoria writing about his northern surveys and his many adventures in the north. He died of a heart attack in his home in Victoria August 17, 1966.